NOTE: BEFORE BOOKING, please email us for more photos and property information as well as letting us know if you will require the optional parking permit - available from May 2018. Where possible owners try to operate a Saturday / Saturday calendar, or if your stay is less than 7 nights, a Sunday or Monday start is preferable. Dartview in Dartmouth is one of only a handful of Dartmouth properties which provide a full view (by way of lounge patio doors) of both sides of the river (i.e. both the near and the far river embankment) from the comfort of your lounge. Breathtaking river views from lounge & balcony. Townhouse conversion. Superbly convenient for all Dartmouth has to offer. One minute walk to town, harbour, quaint historic taverns, restaurants & great shops. Excellent value given the quality, views and location. Comfortable and superbly located property over two floors. Comfort and style. Email us for photo brochure & more detailed information. Panoramic riverside location. Superbly equipped, wireless internet, very private. Upside down layout over two floors. 2 bedrooms, 1 with washbasin. Bathroom with sep. shower & bath. The property is less than 60 seconds from Dartmouth's historic quayside. Sugary Cove beach can be reached on foot and the award winning beaches of Blackpool Sands and Start Bay are minutes away by car. For special offers on last minute bookings and late availability deal reductions email us. Please mail us for more information and lots more photos. We recently asked a guest if he felt the property matched up to the advert and our own info. His response was 'Your advert could have made more of the incredible views from lounge and balcony and the superb location in terms of convenient, easy access to everything Dartmouth has to offer'. Well, we thought we'd already mentioned that in the advert but we'll let his comments re-emphasise those points! The property is equipped with everything you would require for a relaxing holiday in Devon. The accommodation comprises of the following: there are two bedrooms, one of which has a hand basin. There is a separate bathroom with bath and shower. The lounge is comfortable and has a TV, Video, HiFi system & wireless internet. The modern kitchen area is fully equipped with fridge, freezer, dishwasher, microwave, washing machine and tumble dryer. Parking is available either outside the property or a public carpark is available approx 2 minutes walk away. Bed linen and exit clean included in rates. Please bring towels. Town Centre Parking Permit available (modest additional charge) AND free street parking outside subject to summer restrictions during office hours (no winter restrictions on street parking outside). Open plan to lounge with dining area. Excellent location within walking distance to all the amenities you need. The view from the lounge window was amazing, something that made the week special. Great property right in town. Fabulous stay over New Year at this property which is also dog friendly. Right in town so no car required. The views are also amazing from the front room. Lovely modern and spotless kitchen area. Thanks for the opportunity to stay at DartView. The beautiful late autumn weather ensured we made the most of walking the coastal paths but being so central it was so easy to wander around Dartmouth waterfront in the afternoons when returned each day. - and the superb views from the lounge and terrace were a real treat. The apartment was comfortable, cosy and well appointed - a real home from home. All instructions and information given were clear and helpful. We shall be returning next year. Thank you so much for our week at Dartview. We found it ideally located for walks into the centre of town or to the beautiful Dartmouth castle and coastal path. The much shorter journey to Bayards cove and the Dartmouth Arms also became a well worn route. Dartview was very well equipped for a long stay and certainly very comfortable. The view from the top floor balcony was stunning and a great place to begin and end the day. We were a little concerned about potential parking issues but followed your suggestions which worked very well. A very relaxing break which we hope to repeat soon. Just got back from a fantastic stay at Dartview (two adults and a 5 year old child.) This property was clean and provided everything you would need. The detailed description and instructions left no questions unanswered. Access was easy and the location was right in the town centre which enables you to explore Dartmouth. The view from the balcony was breath taking and just worth the stay alone. We throughly enjoyed the crabbing near the Dartmouth Arms, there are numerous restaurants within walking distance and fabulous fish and chip takeaways. Great information folder provided by the owners where to eat, what to do etc. We would highly recommend a stay at this property. This property is not to be missed! Situated in the town of Dartmouth, it has stunning views of the River Dart looking over to Kingswear and out to sea.... You can spend many hours watching all riverboat activities, from the comfort of the lounge or balcony. The property is tastefully furnished, and in presenting this property for rental, you really get the feeling that the owner's want your holiday to be an enjoyable and comfortable experience. It is exceptionally clean and fresh throughout ( unlike some I have stayed in!) I have stayed in this property with my family twice now and I find it ticks all the boxes.... especially convenient for morning coffee at Bayards Cove Inn, shopping or evening walks and crabbing along the Riverside with the family. Just hoping to get back there again! 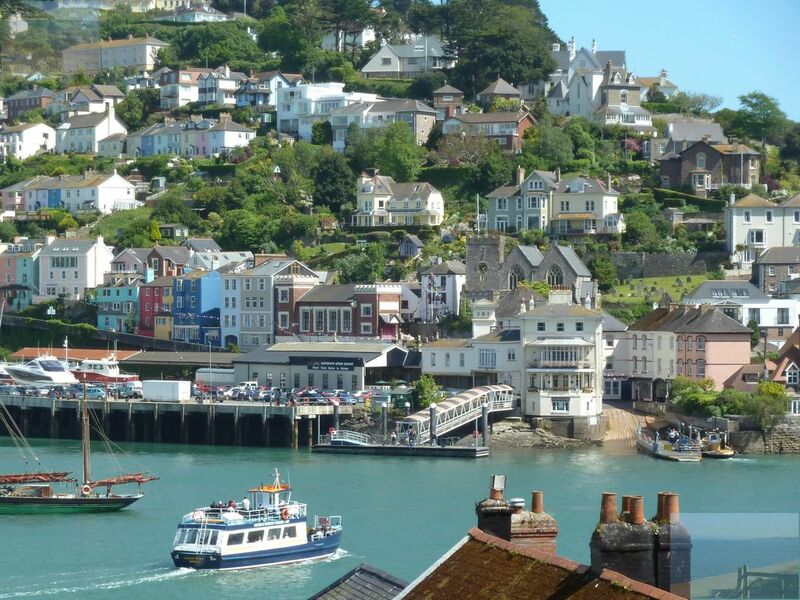 Dartmouth with its beautiful old-world centre is considered the capital of the South Hams, famous for peaceful rolling countryside, renowned coastline, excellent beaches (Blue Flag status) & coastal walks along footpaths leading to secluded beaches. Dartmouth’s focal point is its bustling harbour and broad, wooded river. The town is designated a Conservation Area with 16th and 17th century timbered buildings, historic narrow streets, beautiful old shops, intimate pubs and excellent restaurants. Beach lovers will enjoy Sugary Cove near Dartmouth Castle as well as the beautiful Blackpool Sands and the long, unspoilt expanse of beach at Slapton Sands both of which are approximately 10 minutes drive. Prices incl. linen, WiFi & exit clean. Prices based on two people. If more than two people are staying, the weekly rate for property (not per person) is increased by a modest £25 to £45 depending on time of year.